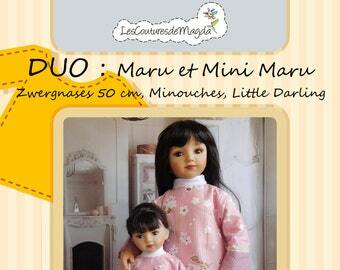 Pattern: 3 rooms for 32-35 cm Little Darling dolls, darlings, Paola Reina. 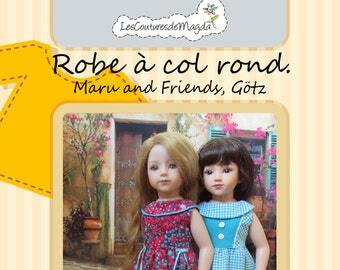 Pattern: Dress with round collar for Maru and Friends, Götz dolls. Belle veste moderne qui accompagne les jolies robes chasubles, Parfait !! C'est une magnifique robe simple avec broderies délicates, j'adore !! All items shown here are handmade in materials like cotton jersey, wool. I mainly work with sewing machine which guarantee a greater strength. 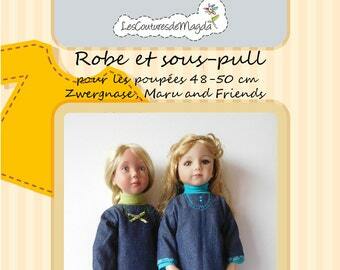 Please read carefully the ads: some clothes are only suitable for one type of doll. 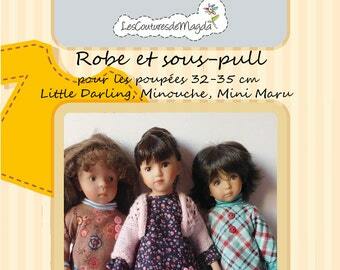 The articles contain small parts: pendants, buttons etc... they are not suitable for children under 4 years. Returns are accepted only when it comes with tracked items, within 5 days after receiving it. Thank you for contacting me before. Articles must be in their orginal packaging. Shipping costs are at your expense. Payment is expected within 5 days. If you experience any problem, please contact me. I send my items after receiving the payment within 2 to 5 days, most of the time the same or next day. Shipping costs are without tracking, if you want a most secure shipment, let me know. I am not responsible for loss and damage caused by the shipper.